Ten little toes right from the start make footprints on your mommy's heart! The timeless journey of a mother and son is poignantly captured in the story of a boy's growth from childhood to fatherhood. From birth to football games to college graduation, a mother reminds her son that life is filled with possibilities and that God has a plan for him--whatever he grows up to be! All you boy mommas need to grab a Kleenex before reading this one! It is such a poignant reminder that the days may be long but the years fly by. Before you know it you will be looking into the face of your precious grandbaby. 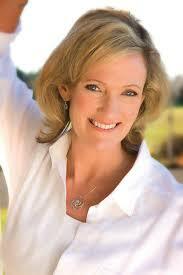 Through the use of rhyming verse Karen Kingsbury takes us through the journey of a mother and her beloved son. As each milestone passes the momma is there to cheer her son on no matter what he grows up to be. The story begins with the birth of her own son and goes through all the life stages up to the point of the birth of her grandson. The illustrations by Valeria Docampo are absolutely beautiful. I love the bright colors and the whimsical paintings. While this is technically a children's book I think it would make a marvelous gift for Mother's Day for all the boy mommas and even the grandmommas!